‘Tis the season to share. 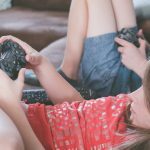 So, we thought it would be cool to share an awesome list made by Eric Vole of the ‘Top 10 Christmas Themed Video Games’. 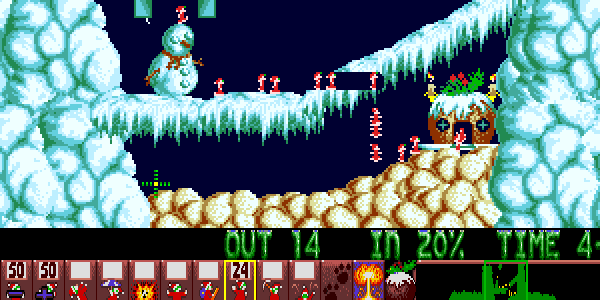 Christmas Lemmings or Holiday Lemmings refers to a series of games, expansions, and demos with a holiday theme. The length of these games vary with some being 64 levels long, but there is not much to them. The original Lemmings games were about getting humanoid lemmings past obstacles to a designated exit – This was accomplished with lemmings’ skills such as digging, building ladders and more. It was an addictive, and fun puzzle game. Christmas Nights into Dreams is a two-level, Christmas themed Nights game (an action game released on the SEGA Saturn). The graphics, levels, and music are all Christmas themed. Unlike Christmas Lemmings, Christmas Nights into Dreams adds more than just a Christmas themed cover. There is a whole new story with the main character and the children from the original game re-joining Nights on a quest to retrieve the star that sits on top of their tree. Plus this game is gorgeous, so play it! Special Delivery: Santa’s Christmas Chaos was the first game where you could play as Santa Claus. You play as Santa on Christmas night and must deliver presents to all the girls and boys. Even though you are just delivering gifts throughout the entire game, three separate game modes get harder as time goes on. Duke Nukem: Nuclear Winter is a premise so bizarre, that it just has to make this list. 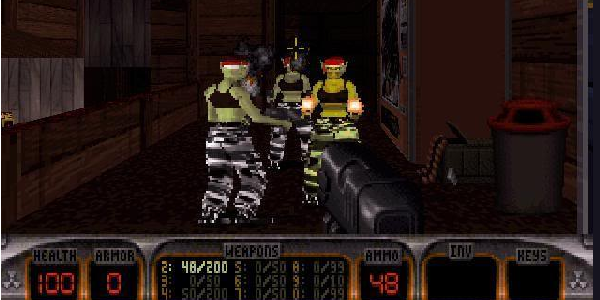 Nuclear Winter is an expansion pack developed for 3D Realms’ Duke Nukem 3D. While it wasn’t the best or best-received expansion pack, it’s the most interesting. The alien horde defeated in the original game is back, and this time they brainwashed Santa Claus. Also, Duke must face new enemies known as the “Feminist Elven Militia” (pictured below) and evil Snowmen. Duke has to go to the North Pole to stop Santa and the evil alien maggots from completing their diabolical plan. It is another game you may not have heard of, but it’s another fun one for the Commodore 64. Frosty, the Snowman aka Frosty’s Busy Night, was a free game packaged with an issue of Your Commodore magazine. This game is quite similar to Dashin’ Desperados on the SEGA Genesis where the screen is split in two, and your goal is to race player 2 in a platforming/racing game and avoid obstacles. If you hit an obstacle or pit, you’ll melt. For a free game, this is quite fun. It’s very competitive as you race and continuously look at your opponent’s screen to see who’s closest to the goal. If it’s Christmas you know we have to talk about Die Hard. Some people don’t think the Die Hard series are Christmas movies, but the first and second took place during the holiday season… so they count! Just like Gremlins. Since Die Hard Trilogy on the PS1 has three games each based on one of the movies, 66% of this game is Christmas themed. 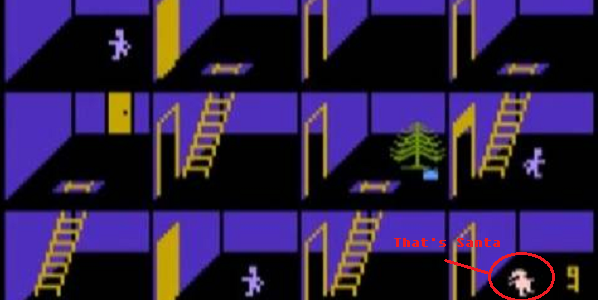 Another game where you play as Santa Claus? Yes, but you also get to play as demonic-Santa, which is awesome. 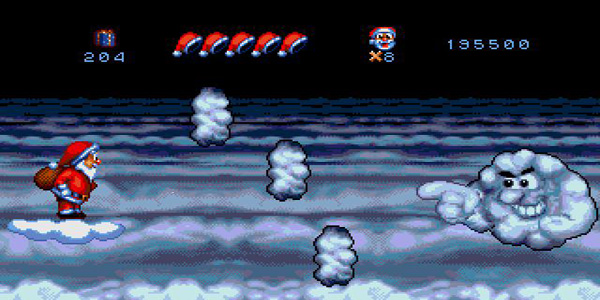 Daze Before Christmas was a game released for the Mega Drive and Super NES. An evil snowman has captured all of Santa’s elves and reindeer. You must save them and thus save Christmas. Daze Before Christmas is a semi-solid platformer, with a few issues, but still fun nonetheless. As mentioned above you play as Santa. You use Santa’s magic to turn your enemies into presents. When people are talking about Christmas movies and games, this one is often forgotten. 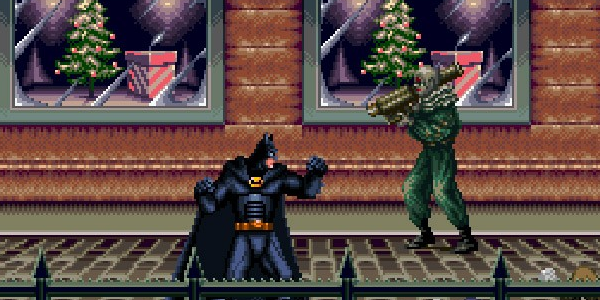 However, the majority of the film and game based on the film take place during the holiday season. Batman Returns was a beat-em-up released for numerous consoles. This was a sidescrolling beat-em-up, very similar to the Final Fight series. In this game, you play as Batman as you punch and kick members of the Red Triangle Circus Gang. In addition, Batman has numerous moves where he can slam enemies in the background, and use gadgets such as the Batarang. 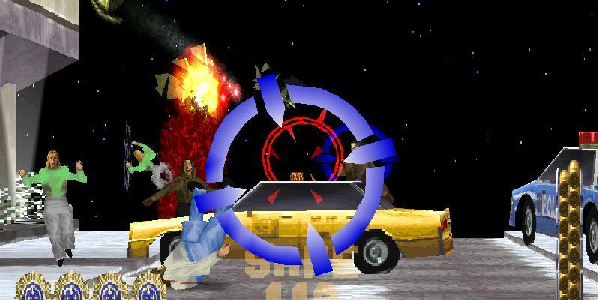 The gameplay is broken up with driving sections, and boss fights that require strategy. The best thing about this game is the atmosphere. It’s dark like the movie but an ironic juxtaposition with the Christmas and snow decorations. James Pond II: Codename Robocod or Super James Pond as it was called in the states, is a Christmas game often overlooked. I assume it’s because the James Pond series just never seemed to get the same recognition as other platformers of the time. Super James Pond takes place right after the original. James’ rival, Dr. Maybe has escaped and taken over Santa’s Workshop. He took Santa’s workers hostage and converted them to evil. James Pond must save Santa’s workers and stop Dr. Maybe once and for all. The game is a typical platformer with a few twists. 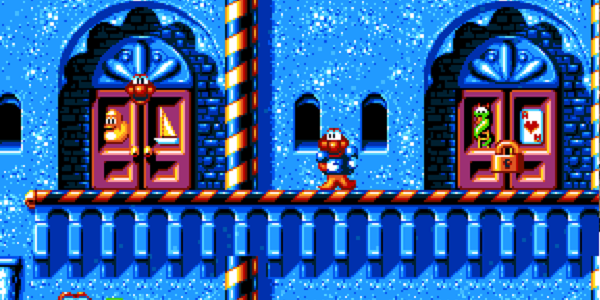 There are 50 levels in all but this time, James Pond has a robotic suit which enables him to stretch his abdomen across the majority of the screen. This game is just fun and full of vibrant colors to get you in the Christmas mood. There are a lot of Home Alone games, and while none of them are bad, the Christmas version has to be a crowd’s favorite. The Genesis version of this game basically follows the film. Kevin must stop The Wet Bandits from stealing valuables. However, in this game, Kevin has to protect all of the houses on his street. Eventually, the cops will show up and save the day. Similar to the NES version, this game is all about time. You must stop the Wet Bandits from robbing and flooding the homes on the street for 20 minutes of real time on normal difficulty, and 40 minutes on hard difficulty. The Wet Bandits will drive around in their van looking for a house to burglarize. You follow along on your sled, (which is the best part of the game) until they decide on a house. Once inside, you must fill the Wet Bandits’ pain meter up all the way before they steal everything and flood the house. 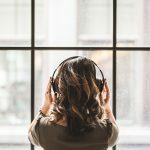 How do you fill the pain meter? With guns of course! You use a BB Gun, a Rifle, an RPG, a mortar to defeat the Wet Bandits.